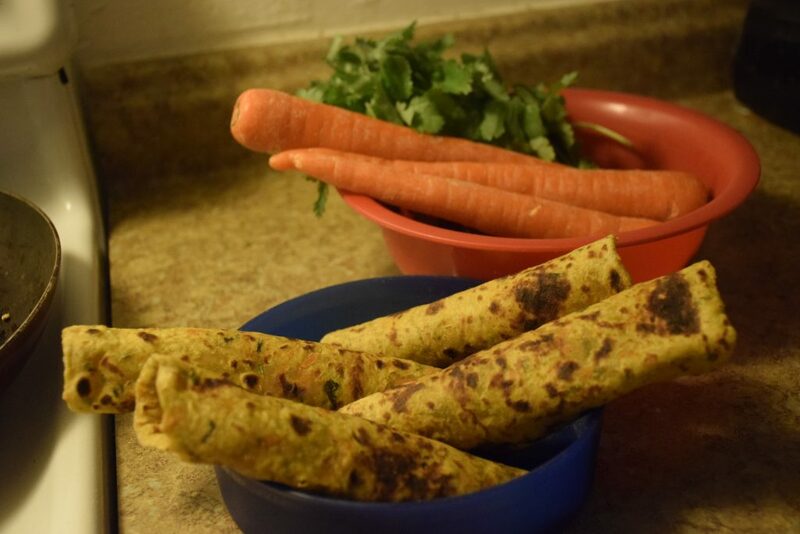 Carrot-cilantro stuffed bread or Thepla – a Gujarati parantha, is famous as a lunch-box dish and a wholesome treat in itself. 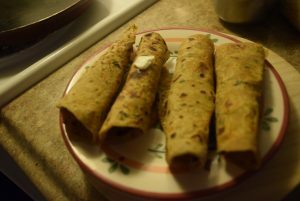 I have tried different kinds of “thepla”, and will share their recipes soon after this one. This post was long pending , and I was finally pushed to write this down with the inspiration derived from my multi-talented blogger friend “Prathima Koneru”. Not only she , but many other bloggers , friends inspire me all the time. I always like soft ,thin theplas. Hence the dough for theplas is moist and soft. Avoid adding too much salt in the dough, since it could make the dough too wet or non-pliable. 1. Take a tureen (parat) or a platter(thali) . Add all the flours in it viz, atta, besan , maize or Finger millet or buckwheat flour etc according to your choice. Atta and Besan are must ,rest you may add or subtract according to the availability. 2. 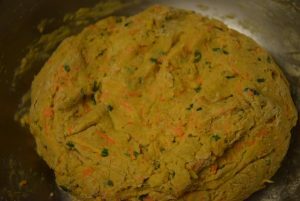 Now add all the dry spices like turmeric, red pepper, sugar, coriander powder ,curry powder, cumin powder , hing and salt. But if you are thinking of using the dough later , then don’t add salt or add in minimum amount. Salt will make the dough absorb more moisture from the air while making theplas and will make the dough sticky. However, you may make all theplas at once from the dough and keep them wrapped lined with paper towels and in a foil for having them later. They stay fresh for as long as three days in normal weather conditions. 3. 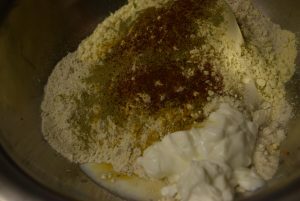 Add the yogurt in the flour. Mix them roughly. 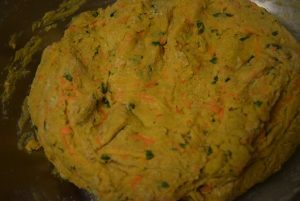 We don’t add any water since the curd and the carrots juices or any vegetables’ juices make up for it. 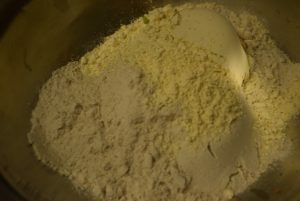 If you feel the dough is still rough and not combining ,add a tsp of curd or a tsp of milk to the dough. 4. 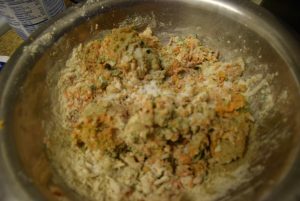 In the end add the chopped cilantro and grated carrots. 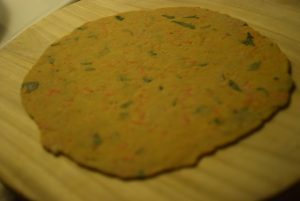 I grated the carrots with my food processor, hence I used only 15 mins to make the dough. 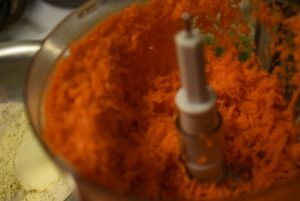 If you are grating carrots with a shredder, it might take more than 15 mins to prepare the dough from scratch. 5. Mix everything together with hands to form a soft dough. Don’t knead it otherwise, it will get sticky later on. 6. Cover it and keep aside for 5 mins. Yes , you don’t give a rest time of more than 10 mins to this dough, reason is the salt again. 7. 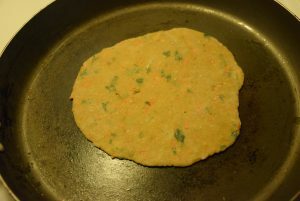 Heat you griddle (tawa) on medium heat. In the meantime, make pedha (small roundel) from the dough. 8. 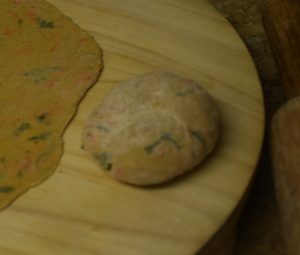 Roll each pedha (in between dusting in dry wheat flour) with a rolling pin(belan) on your counter or chakla(rolling board) in a thin circular disc. The dough should be soft and pliable. 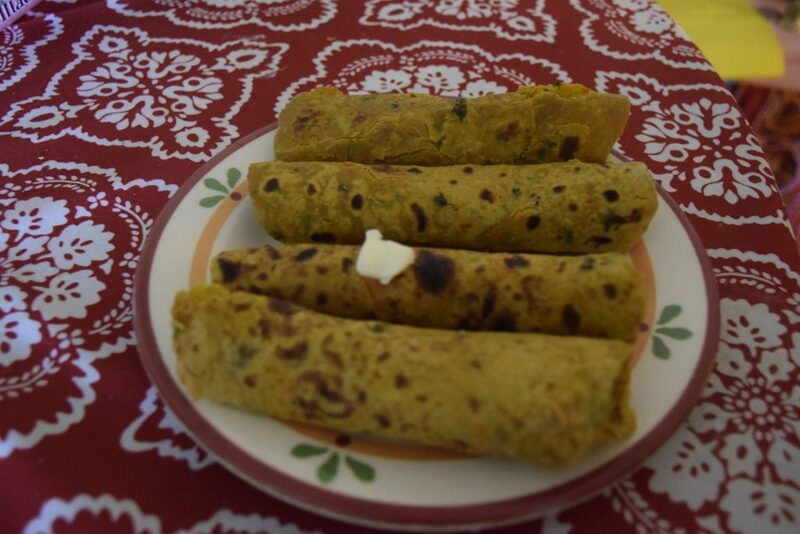 If you want you can cook them like paranthas with a lot of ghee or oil. I , however, like the thin non-fatty theplas. 9. Let it cook on one side for 3 to 4 mins. Then flip it to the other side and let it cook for 2 mins again. 10. Once both sides are cooked, smear just a tsp of oil on the top and flip it again to bring the front side up again. Let it swell and cook till you see little brown spots on both sides. You may partial cook them ,if you are making for the next day. So that when you warm them again on tawa ,they will be cooked fully. 11. 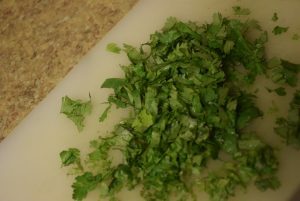 Take it out on a paper towel or parchment paper and in the similar way roll and cook all the theple. 12. Stack them in a wooden basket or casserole in a kitchen cloth or foil to keep them fresh. You can place them in zip-lock bags (in a stack of 4 in each bag) and carry while travelling out of town. Enjoy these theplas with a sip of hot tea and Green chutney or pickle or have them in lunch with pickle, onions and Chhachh. They are a good option of feeding vegetables to your picky-eaters. 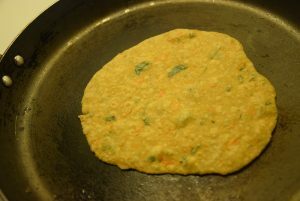 😉 You may add opo squash/bottle gourd, chayote squash, apple gourd, zucchini, raddish, etc any juicy vegetable to make these thepla. For more recipes, continue visiting this site.. 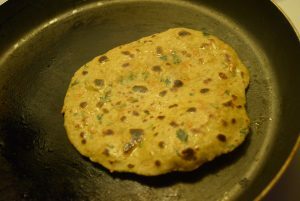 This entry was posted in Food, Main Course, Recipes and tagged atta, barley, basic, besan, Carenshare, carrots theme, cuisine, Foodies and Bloggers, good for travel, grounded recipe, group, Gujrati, Indian, jowar, kathiawadi, lasts long, long shelf-life, mix of flours, ragi, rajasthani, rustic, served with pickle, shweta jindal, thepla, theple, traditional, with butter, with Chhachh, zindagisikhati.